There are many ancient cities in the world. Each one has its own charm embracing different cultures. But Bagan, the heart of Myanmar is not just an old capital that you usually read about in travel blogs. It is a life-goal, bucket list and dream of anyone who loves to travel. Here are 13 reasons why you should go to Bagan at least once in your life time. Do you know the age of Bagan? It is over 1000 years old city and the first capital of Myanmar. Despite many disastrous things such as earthquakes, storms, wars, it is still glorious with 2000 ancient pagodas with all the arts, tradition and cultures from earliest Myanmars, telling proud history of first ever Myanmar Kingdom. 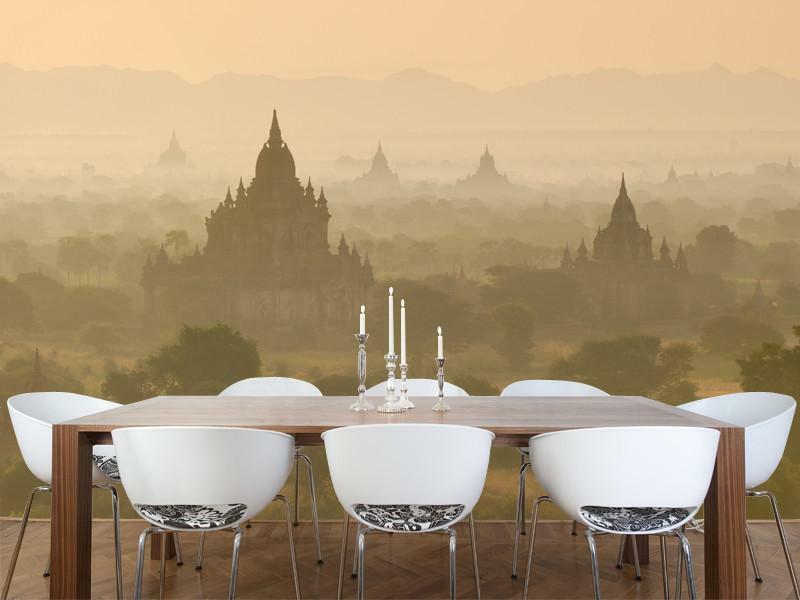 In this era of everything being uncertain, you should feel the taste of ‘forever’ by visiting Bagan. It is a pure wonder if a building without metal lasts over one thousand years. Yes, Bagan has tough buildings like that in which you can’t even put a needle between two slices of brick. Ancient Myanmar used their own formula of cement which can resist climate changes, earthquakes, vine trees, insects. They adjust the lightings and airflow to the ease of visitors and making more glow to main Buddha figures. Though there are over 20000 pagodas left, each has its own unique architectural design and meanings: for example, Kan-Dot-Palin in Myanmar means “A Place for Paying Respect” and its stairs are on the outer walls openly unlike the others whose stairs are inside and secret. Pagodas and temples in Bagan are famous for the delicate art features decorating every single inch of the buildings even filling the roof. Not only the history of Buddha but also the figures of other religions are described as wall paintings, stone sculptures and even in baked clay designs. Each temple has different designs and characters showing the class of art and creativity by bagan citizens. The color combinations, the longlasting paints, the way of summarizing a story just in a small square and most importantly, beautiful outlines of characters will take your breath away. Today’s events are tomorrow’s history. Each building in Bagan was built in a way of telling about the donator, the reason of building this temple and events at that time. For instance, Ma-Nuu-Har Temple is famous for its closely-fitted walls and huge Buddha figure because it is believed that this design is telling the life story of King MaNuHar , a prisoner of war under King AnawYaHtar. Bagan can give you the landscape that you can’t find anywhere in the world. The combination of pagodas and tropical trees with the background of clear sky and mountains will always be the best scene you can see in your life. It doesn’t matter if you want to be photographer or model. Bagan will definitely satisfy you with various Instagram places such as over-view from top of a temple, lovely alleys between Pagodas and trees, walls full of paintings and calming riverside. 6. Sunset of Sunrise? Both are incredible!!! Do you know that Bagan is one of the top five places with most beautiful sunsets and sunrises in the world? Every mornings and evenings, a large number of tourists excitingly wait for the sun in various view points in Bagan. And if you want, you can even feel the golden beauty of pagodas under the ruby sun by riding hot air balloons. Vogue Me describes Bagan as one of the most beautiful places for hot air balloons. The stunning sun sending the colorful rays all over the horizon will surely remain in your memory for the rest of your life. If you visit a place, apart from photos, the thing remained with you is souvenirs. Yes, Bagan’s best souvenir is Yoon, Myanmar lacquerware. Due to so many steps and a large amount of time to make, real Yoon is very durable to pressure and heat. Unlike most souvenirs, it can be really used in your daily life since it cannot be broken even if you throw it to the floor. Yoon made with horse tail are so resilient that even if a person steps on it, it can immediately returns to its original shape. Yoon is made of completely organic products and the fragrance of Yoon means that your food is non-toxic. The longer you use, the brighter the color. Awesome, isn’t it? So if you want to buy the souvenirs you would use for decades, come to Bagan which is the only place in the world where Yoons are made. Visiting a place means tasting that place’s food. Though you can’t like every food of every place you’ve visited, Bagan will please you with its simple yet tasty food. The palm juice is perfectly sweet & naturally cold for Bagan’s weather vanishing your fatigue right away. And its upgraded version, palm wine is so fresh and healthy that it will make you want more without harming your liver. But you have one best thing left. The beef steak marinated in palm wine will take you to another level of food heaven with its softness and flavors. Moreover, Myanmar cuisines can be found in Bagan’s style with plenty of fresh vegetables and beans. So even if you are a vegan, Bagan is the place of choice. Oh! Don’t worry about the price since the foods are so fresh and delicious. Most of the restaurants are under 5 dollars for your one full course meal. After you’ve seen amazing paintings on the wall of Pagodas, won’t you want one as your own? Here, the body art painters will make your wish come true just by the brush in their hand. Wonderful and no-two designs from your dream can be painted on your hands and body by street artists in Bagan. So get the painting , make a Bagan dance post and here is your insta picture. And if you want souvenirs for the wall of your home, more than a simple photo of Bagan, try the unique Sand-art picture which is made purely of sand and amazingly vivid, colorful, and washable. If you want to see the sculptures in Pagodas become alive, there are many places showing Bagan dance every night. It is unique, beautiful, and highly detailed dance which tells the emotions and stories through the well-planned graceful body movements, along with the matching lively music. You will surely amazed by sounds produced by so simple Bagan instruments. Another fun things you can do in Bagan is you can wear the real Bagan royal costume and get on the horse cart as if you are the royals of Bagan era. 11. Mountains, Plains, Beach… All in one! If you have a group of friends with different places in mind for travelling, Bagan is your destination. Near Bagan, Mount Popa is world famous for being a calm volcano, its incredible sceneries, various kinds of plants and weather just in one mountain. So, what are you waiting for? Go and hike!!! For water lovers, The breeze running across Aye-yar-waddy river will relieve all your stress and fatigue. Bagan is not only a beautiful ancient city but also the old capital at the center of economics for middle Myanmar. So, if you want to choose, any route to Bagan is readily accessible, really comfortable, reasonable price and very beautiful. There is Nyaung-Oo airport for many flights from Yangon. The Yangon-Bagan train is clean and cheap yet the sceneries along the railroad are mesmerizing. One of the best routes to Bagan is via Aye-yar-waddy river. You can choose regular ships or even a cruise. The favorite way of most locals is by express car which is easily available every day and various departure times from Yangon. You can all easily find the above available every day and various departure times from Yangon. You can all easily find the above ways in www.green-myanmar.com. 13. The place is gorgeous but the price is….. Surprisingly worthy, even a bit cheap. For marvelous bagan tour, you won’t have to use your life savings and golden annual holidays. With just under 70 US dollars and a usual weekend, you can enjoy the wonderful tour of Bagan at www.green-myanmar.com. So, travel to Bagan and enjoy the time of your life.